I'm looking at the login screen, and there's no Pleroma or Friendica options. How do you log into those networks? Selecting Mastodon option? Yes, I need to update that. 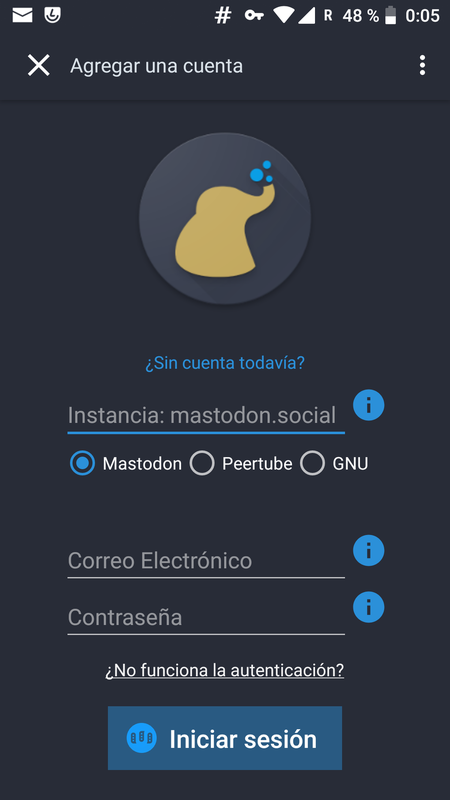 For Pleroma choose Mastodon, for Friendica choose GNU. @tom79 @switchingsocial @fdroidorg Ok, thank you. Very good job with your app, man; congratulations. Is it (yet) possible to move from #Mastalab to #Fedilab without such loss? There is an export / import feature, so you should not lose your data. @tom79 @fdroidorg @switchingsocial @bauglir @FuzboleroXV every app should have that feature! - Could I run into trouble if I use Mastalab and Fedilab _simultaneously_ on the same phone while having the same accounts on both, imported into Fedilab, or do you think that should work? Sorry, I was unclear on this part. You have nothing to do for having Fedilab. It's simply an update. In other words, Mastalab app will be automatically replaced by Fedilab app (name and logo) and all your current data will be kept. You will not lose anything. oh, ok, so will that also happen/work when installing #Fedilab through #FDroid after the existing #Mastalab initially was installed through Google Play Store? @FuzboleroXV @fdroidorg @switchingsocial @bauglir @tom79 when switching an app installed by play store to same app on fdroid, you have to uninstall it first. Going to try immediately (I couldn't update for a while from f-droid with APK not found errors). @tom79 Strange, it is not working. I'm on v1.13.1 and latest version of f-droid (samsung s7). Download failed, mastodon_222.apk not found. This is a really old version from september 2018. The versions you mention are not in the list of available ones. Should I reinstall from Google Play? Never mind. I got it. Thought f-droid would automatically show latest updates when going to that window, but I had to 'drag down' to trigger a refresh. Thanks so much for all the great work on this project!! @switchingsocial @fdroidorg @tom79 this app is great ! I use it every day. The multi services support shows how superior and full of possibilities is an open standard for the open web !